The River Breamish trickles into life south of Scotsman`s Knowe on the remote slopes of Cairn Hill, an outlier of the mighty Cheviot. 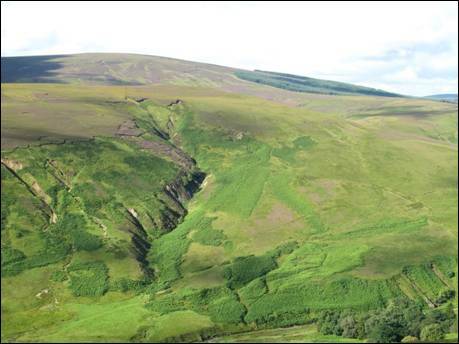 The narrow, upper reaches of the Breamish Valley are flanked by an `avenue` of steep sided hills, including Cushat Law, Shielcleugh Edge, High Cantle and Shill Moor. The Salter`s Road, an ancient trade route across these wild northern hills, cuts through the peaceful valley as it twists and turns its way to the Scottish border. The heather moors, way above the valley floor, stretch out towards the `Premier League` heights of Hedgehope Hill, Comb Fell and a more distant Cheviot. This walk is a predominantly high level journey of windswept summits and vast, faraway views. This is epic Cheviot walking. 1. Just north of Powburn an unclassified road leaves the A697 and heads for the Breamish Valley, a long time favourite picnicking location for Tyneside families. After passing through the tiny village of Ingram, which has a recorded history dating back to the 11th century and was one of the `Ten Towns of Coquetdale`, the single track road crosses the 1908-built pre-cast concrete Peggy Bell`s Bridge. The winding road then leaves the valley behind as it climbs past the buildings of Greensidehill towards the farm of Hartside. Immediately prior to the farm buildings there is adequate verge parking (GR NT 978162). A private road continues as far as the small hamlet of Linhope, from where a track climbs to Linhope Spout, an impressive and popular 60 foot waterfall. This is your direction of travel, so on with the boots, lock up the car and head for the hills. This is a gentle and pleasant start to the day as you gaze towards Shill Moor and Ritto Hill with the River Breamish re-emerging, to your left, after a horseshoe journey around the southern slopes of Hartside Hill. After ¾ mile the road crosses over the Linhope Burn and culminates at the picturesque hamlet of Linhope. Straight ahead, hidden within the trees, stands Linhope Lodge, built in 1905 for Lord Joicey of Ford Castle in the style of a bungalow in the Himalayas of British India. 2. Turn left, pass through the small gate next to a five bar gate and then immediately turn to your right. With the fence and trees on your right, follow the grass covered path which very quickly merges with a rough gravel track. In less than 100 metres, go through a small gate, adjacent to a much larger five bar gate, and continue uphill, caught between the eastern slopes of Ritto Hill and the plantation edge. As the gradient begins to ease ignore the signpost on your right for Linhope Spout, you will need to save this for another day, and continue straight ahead until you reach, on your left, a track. Straight ahead lies the route to Hedgehope Hill, the second highest of the Cheviot Hills, but, once again, this is a trip for another day. Turn left along the tyre-indented track and on reaching the five bar gate, go through. Nearby, lie the remains of a small Bronze Age settlement and also the remnants of two Roman period settlements. Keep with the track and, as you gain some further height, the flanks of Shill Moor come into view slightly to your left. When the track begins its gentle descent and splits in two be sure to head for the left hand five bar gate. Once through, take the right hand spur and begin a long and gradual climb uphill on a clear, occasionally boggy, quad track. 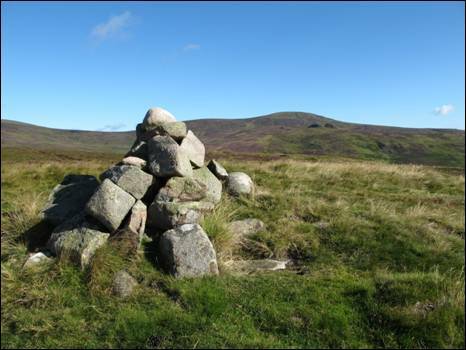 Eventually, you will pass the height of Rig Cairn (GR NT940167) topped with a small walkers cairn and this is an ideal place to enjoy the views of your onwards route. The tops of High Cantle and Cushat Law are clearly visible ahead, whilst a quick glance behind will revel the distant North Sea coast. The broad girth of Shill Moor and the pointed top of Great Standrop are also prominent. Continue with the track over relatively damp ground and, in time, you will reach a five bar gate in a post and wire fence. 3. This fence, which links High Cantle with Coldlaw Cairn, never falls below the 456 metre mark on its 3¾ mile journey towards the summits of Comb Fell and Hedgehope Hill. However, your encounter with this `navigational aid` is all too brief. Cross over the fence and head straight on, away from the fence, and very quickly you will join a clear, green quad track. Now turn right and walk the short distance to the cairn topped summit of High Cantle (GR NT927162). At a `mere` 482 metres in height this is a tremendous vantage point. Take time to enjoy the views. To the west, the route of the Salter`s Road is visible as it turns behind an animal feed store on the valley floor and climbs across Nagshead Knowe towards the distant Uswayford Forest. This is your ultimate direction of travel. But first a sharp descent. Follow the directional fingerpost close to the summit, heading gently downhill on a green track and, on reaching a second fingerpost, turn left and head steeply downwards on a thin path. Three more directional fingerposts followed by a step stile will lead you onto the floor of the delightful Upper Breamish Valley next to an old railway goods wagon. A `cleugh` is a narrow ravine or cleft with an accompanying watercourse and the thirsty River Breamish feeds from more than its fair share of such cleughs. In little more than the 2½ miles that separate Breamish Head and the remote farmstead of Low Bleakhope some seven cleughs flow down into the river. They bear such names as Hareshaw, Cow, Cat, Black, Shiel, Inner Quickening and Outer Quickening. You are now joining the Salter`s Road, a cross-Cheviot route, previously known as the Thieves Road, which was once used for the transport of salt from the North Sea coast to Scotland. Turn right, cross over the step stile and take the left hand track to the footbridge over the River Breamish. In a very short distance you will reach another footbridge, this time crossing the Ainsey Burn. In both instances, you have the slightly more exciting option of splashing your boots through the adjacent fords. Follow the track around the animal feed store and stay with the track as it climbs across Nagshead Knowe next to a post and wire fence, with the Ainsey Burn below you to your left. Stay with the fence past the second corrugated animal feed store and when the track turns away to your left, follow it. Now keep a keen eye on the rough, damp and sometimes faint track as it is easy to drift away from your intended direction of travel. As you gain height and the gradient begins to ease, you should be setting your sights on the lowest point of the forest boundary, between the slopes of Bloodybush Edge to the left and the less severe gradient of the Lint Lands to the right. This is the point where the Salter`s Road cuts through the swathe of the Uswayford Forest passing Davidson`s Linn on its way to a rendezvous with Clennell Street. 4. On reaching the forest edge (GR NT904157), a small gate and an adjacent step stile it is time to leave the Salter`s Road and to start the just short of 1 mile journey to the summit of Bloodybush Edge. This involves a total of 142 metres of ascent over sporadically rough ground with the post and wire fence, to your right, for company. On reaching level ground and a step stile, climb over and head for the triangulation pillar, little more than 10 metres away. Here (GR NT902143), on this 610 metre high summit, there is a tangle of converging fences, gates and wooden posts. The views are excellent, with those to The Cheviot, Comb Fell and Hedgehope Hill especially drawing the eye. A `Hewitt` is a hill in England, Wales or Ireland which exceeds 2000 feet in height, with at least a 30 metre drop on all sides. There are 525 `Hewitts` in total, with 177 of these being in England. You are now standing on the lowest of these English `Hewitts`. Re-cross the step stile, turn right and, with the post and wire fence on your right, begin the south eastwards descent of Bloodybush Edge. To the south lies the extensive Kidland Forest which clothes a complex area of small, rounded hills, burns, cleughs, sikes, shanks and waterfalls. In 1825, in his book `An Historical, Topographical and Descriptive View of the County of Northumberland`, E. Mackenzie described this extensive area as consisting of “a number of lofty, verdant hills, of conical form” adding that, “they appear like a number of beautiful hillocks rising gradually in exact arrangement”. Not content to stop there he went on to say that, “the glens which divide these hills are of every variety of form, and exhibit, in summer, all that is picturesque in the most beautiful mountain scenery”. Whilst the view over the vast Kidland Forest, as you climb alongside the guiding fence towards the top of Cushat Law, is not unattractive, the pre-forest vista as described by E. Mackenzie, would surely have won any past versus present `beauty contest`. The area is also peppered with derelict and redundant sheepfolds, a reminder of the former life of these now tree-blanketed hills. 5. Within just less than 2 heavy-legged miles after leaving the summit of Bloodybush Edge your high level, fence-hugging route will bring you and your peat-splashed boots to the 615 metre high top of Cushat Law (GR NT928137). Affectionately known as `The Monarch of Kidland` this hill is, like its neighbour, classed as a `Hewitt`, ranking 172nd in England and 302nd overall. A tumble of stones, just to the north of the summit, provides shelter from the wind and offers a relatively `dry seat` from which to admire the grandstand view. From the summit a series of boundary stones run south eastwards to Sting Head with each stone bearing a `K` on the west side and an `N` on the east. These letters refer, in all probability, to `Kidland` and `Newminster` respectively. Time now for you to leave the summit. So, with the fence and stone shelter behind you, head in a generally northerly direction picking up a faint track as you go. 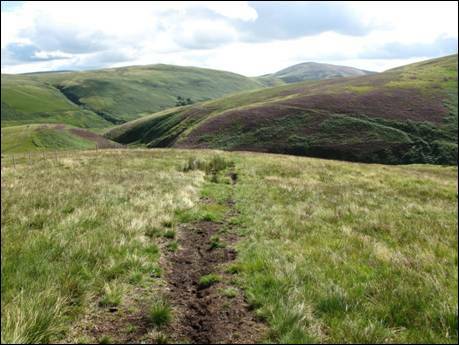 After a short distance you will need to leave the track and turn towards the north east, heading downhill with the cleugh of the Smalehope Burn firmly to your right. On reaching a clear peat step, aim for the green mossy area more or less straight ahead and, after nearly 100 metres, you will join an embryonic track over initially rough ground. This track, which soon becomes more obvious, bends towards the east as it leads you over Bush Knowe. As you get closer to the pass between Shill Moor and Bush Knowe, the track splits in two, so be sure to follow the spur to your left. Eventually this will land you on the flatter ground of the Salter`s Road (GR NT943146). 6. To your left, the track heads down hill towards the Breamish Valley and the isolated farm of Low Bleakhope. In his 1936 book `The Rambles of Vagabond`, Frederick A. Wills wrote, “It is not too far along to Bleakhope where milk and cream and eggs are to be had at the end of the deep defile between Shill Moor and High Cantle”. You will have to leave the milk, cream and eggs for another day, as your route now heads to the right, where very quickly you cross a step stile on your gentle climb and then short descent towards Little Dod. Before reaching the top of this 386 high hill an arrowed fingerpost (GR NT950142) directs you to turn to your left and to follow the green track across the slope of Scaud Knowe. The Shank Burn lies below you to your right as you follow the easy downhill track and the occasional directional fingerpost. To your left there are good views of Ritto Hill, Dunmoor Hill and the granite tors of Great and Little Standrop. Eventually you will cross the Rowhope Burn, before climbing to a ladder stile leading you to the rear boundary wall of Alnhammoor farm (GR NT971153). Continue in the same direction until a shin high directional marker is reached and at this point turn left through a gate. Walk straight across this small field, with Alnhammoor above you on your left, leaving via a step stile. 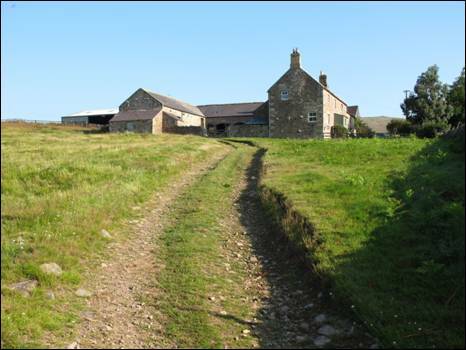 Turn right along the tarmac road, cross the River Breamish via a bailey bridge and after little more than half a mile of further walking you will be back at Hartside Farm. 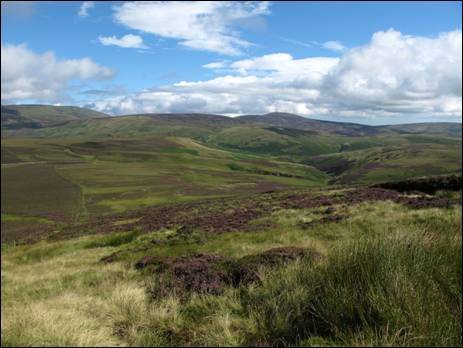 As you make your way home you will, perhaps, reflect on the joys of this truly classic Cheviot walk. Mixed fell, often boggy, with steep ascents & descents, some good paths, a gravel track, two stretches of tarmac & sections of pathless terrain.